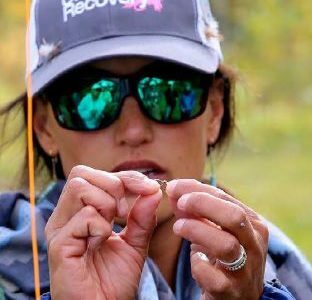 Filmmaker, photographer, graphic designer & co-owner of TwoFisted Heart Productions, she is also founder & president of Braided, a fly-fishing group in Durango, CO, that’s making it easier for women to learn to fish or find a fishing community. ORVIS: How long have you been fly fishing? ORVIS: What’s your most memorable experience on a TwoFisted Heart shoot? KS: I have a lot of them. That’s one of the best parts of this line of work – getting to have amazing experiences, and a lot of the time, getting to create those memories with my husband and other friends. One of my most recent memorable shoots came this past October. It was my birthday, and we were in Spain for a project. We took a helicopter to a remote area of the Pyrenees, and spent the day fishing and filming in a high alpine lake. The setting was incredible, surrounded by mountains rich with history and beauty. We got to sight-fish for wild browns until the sun dipped behind the peaks and the helicopter picked us back up. It’ll be tough to top that birthday. ORVIS: What ignited the spark to start Braided? KS: Recently, we were able to fulfill a lifelong dream and move to the mountains in Colorado. In part, we were driven by the desire to have more access to the outdoors that we loved, and to have closer friendships with people that loved the outdoors like we did. Once in Durango, I recognized it was not hard for Nick (my husband) to find new fishing buddies. And it got me thinking, “Where are all the ladies?” And not just the industry luminaries like Joan, Meredith, and April, and Paula, Camille, and others. I mean locally, in my town, in your town, where are the female anglers? Around the same time period, I had the opportunity to participate in a couple of corporate women’s fly fishing initiatives. The discussion was around how to reach more women and get them involved in the sport. The more I thought about these topics, the more I started to ask myself some questions. What did fishing really mean to me? Was it something I was just doing because it was my husband’s passion, or was it really my own? What drew me to the sport initially? What do I remember most from the times I fished? I thought back to my early years of fly fishing while living in DC. What I remembered and missed the most was not the fishing—it was the people and community we were part of while we lived there. I thought of the last few years, of some of the amazing fish I’ve had the opportunity to catch around the world. So many great memories, but each filled with as much or more thoughts about the experiences I shared with others—the laughs we had, and the memories and relationships I created. That’s why I started Braided—to build that community. ORVIS: What part of Braided most excites you? KS: I love seeing the response we have received in such a short amount of time. We have over 300 members in a little over six months. We have two chapters across the country—one in the southwest (Colorado) and one in the northeast (Vermont). We have women driving four hours in a day to attend events; we had one gal drive from Montana to Colorado to join us. It’s clear to me that we are meeting a need, and that we are onto something with this community. ORVIS: Who has been your greatest inspiration? KS: I had a professor that advised, “fake it ‘til you make it”. At some level, I bought into that philosophy and it carried me through my 20s. At this stage of my life, I am trying to live with greater intentionality. For me, that means having a clearer sense of what my strengths are, how I can contribute to the community and relationships around me, as well as what my true desires are. I am trying to live more from the heart, as vulnerable and risky as that can be. Pursuing fly fishing as my own sport, as my own passion, is part of that process. Starting and leading Braided is not only evidence of that process in me – its meant to be a safe place for other women to live from their hearts, too. ORVIS: Give me a life lesson you have learned from fly fishing? KS: People and relationships matter most. ORVIS: What is the harshest criticism that you’ve endured (and conquered)? KS: Back in the early 2000s I was accepted into a masters program for graphic design. Despite passing all of my classes with flying colors, I failed my midpoint review. The faculty chairs determined my projects were insufficient, and requested that I go back and essentially, start over. I was devastated. Two key events took place after that. I dropped out of the masters program and got an internship. Learning on-the-job and the industry experiences allowed me to grow and develop. I have been a professional graphic designer for over a decade now. The second outcome of the masters failure was that I reevaluated my true desires. I recognized that I had avoided a passion for photography for twenty years. I signed up for an intensive certificate program and got trained in photography. That opened the doors for me to start TwoFisted Heart Productions with Nick. ORVIS: What are some things that Braided currently is doing to help break through barriers? KS: Braided is playing this role as a catalyst at the intersection of corporate and local. Through my production company and with the help of some of my girlfriends around the industry, we have been able to create some incredible partnerships at a corporate level rather quickly. That allows for everyone in our community to experience perks like product demo’s, giveaways, hosted trips, and access to expert speakers. At the same time, we have focused our Braided community efforts on getting local. We have a number of local fly shops, restaurants, breweries, artisans, and others that have played pivotal roles in each of our events. That has created value and vested relationships in a very short amount of time for all involved. For our members specifically, we offer a place where women can come as they are— no matter if they are a novice or an experienced angler. We encourage and challenge one another without pretense and competition; where personal connections, grace, and joy ultimately matter more. ORVIS: What does the Orvis 50/50 On the Water initiative mean to you? KS: I had the opportunity to participate in the Orvis Women’s Lab in 2016, one of the precursors to the 50/50 initiative. It gave me a new clarity of purpose, a clear grasp on why I fly fish. With that knowledge in hand, I knew I had to do something. If this 50/50 initiative was more than Kool-Aid, if I truly believed in it, I had to take action. I had to do something. Braided is that something. 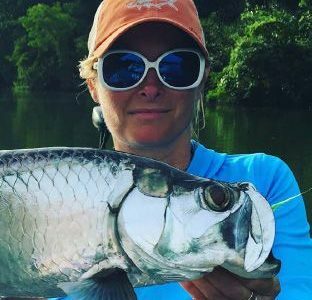 ORVIS: Why is Fly Fishing a great sport for women? 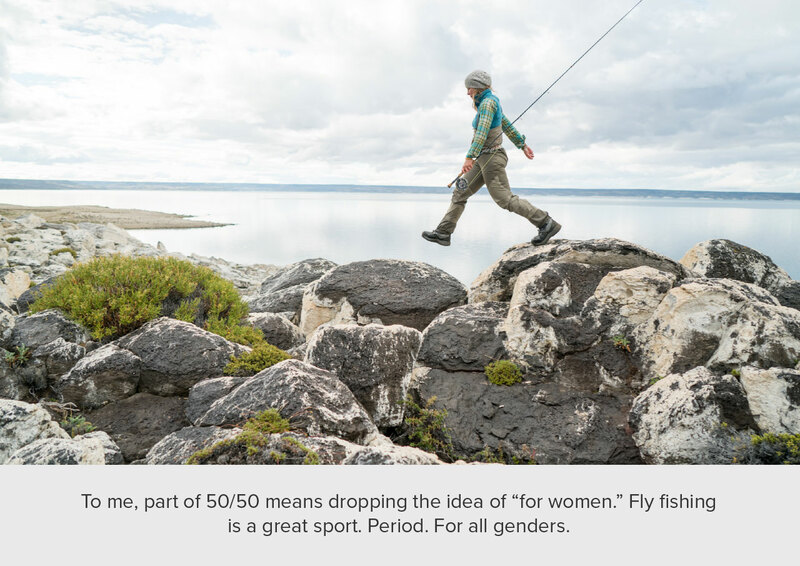 KS: To me, part of 50/50 means dropping the idea of “for women.” Fly fishing is a great sport. Period. For all genders. I love how there is always something new to learn. It continually challenges me and pushes me to be more, without judging where I am now. I love the opportunities to meet new people and experience new cultures or surroundings. I love how fly fishing encourages me to care more for the environment and conservation. And just like my husband, I love how I can grow old with fly fishing. It won’t ever leave me behind. 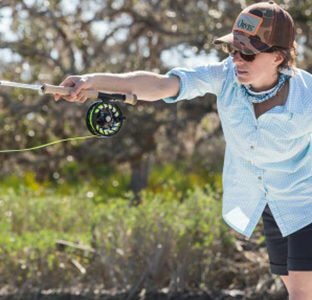 ORVIS: What are your thoughts on the industry’s response to the growth of women in fly fishing? KS: There are many aspects of fly fishing that I think we as individuals or local communities have opportunities to contribute and do our part. If we as women want to fly fish, then let’s go fish. But there is one aspect that I think we are dependent on industry for, and that is the gear, namely the apparel. I am so very excited to see the new lineups of clothes, waders, and other gear that is designed with a woman’s taste and physique in mind. I’m a firm believer that fish respond to cute outfits, although I can’t empirically prove it yet. ORVIS: What do you hope the future holds for you, and what are you excited about in 2018? KS: I have a number of fishing-related goals for 2018. I want to understand my local waters at a deeper level. I want to get certified as a casting instructor. I want to get some formal training to become a better oarsman. Driving all of this new learning is really a desire to be able to teach and share new moments with friends in my life, including new ones that I hope to make this year. ORVIS: Do you have advice for a female audience who wants to spend more time outdoors this year? KS: Schedule it. I am trying to be disciplined about taking one day per month for just me, my thoughts, and being outside. So whether it’s that, or grabbing a couple of friends and hitting the water for an afternoon, my advice is to put it on your calendar. I have realized that if I am not intentional about carving out time to recharge or connect with the people around me, it will not happen. At the end of the day, there is no amount of accomplishments that make up for forgetting to take care of me and the relationships that matter most.